INTRODUCTION. Fracking (hydraulic fracturing) is a drilling process that was first commercially used in 1949, and one whose use has exploded in recent years. Fracking involves forcing fluid at high pressure into a geologic formation containing oil or gas. The fluid fractures the formation, allowing oil and gas to flow to the wellbore (the hole drilled for extraction). Fracking has recently become a dirty word in the media, largely because of protests from environmentalists and know-it-all Hollywood stars complaining about water contamination and environmental damage. CONCERNS. Countless recent news articles, web sites, and documentaries (including a film called Gasland), have chronicled the environmental concerns related to fracking. These stories describe private water wells contaminated with gas, homeowners able to ignite drinking water from their taps, methane-based explosions of homes and wells, wastewater containing radioactivity above drinking-water standards being discharged into rivers, and increased incidences of earthquakes in areas where hydraulic fracturing occurs. Concerns over the air emissions that are associated with drilling and pipeline compression operations also exist. According to them: U.S. fracking operations created 280 billion gallons of toxic waste water in 2012. Since 2005, fracking has used 250 billion gallons of fresh water, degraded nearly 360,000 acres, and released 100 million metric tons of greenhouse gases into the air. “The numbers don’t lie — fracking has taken a dirty and destructive toll on our environment. If this dirty drilling continues unchecked, these numbers will only get worse,” John Rumpler, senior attorney for Environment America, said in a statement. Critics have accused the report of over-hyping the dangers posed by hydraulic fracturing. “Mr. Rumpler is right on one thing (and probably only one thing): The numbers do not lie. But Environment America did its best to try to make them as confusing and meaningless as possible, while ignoring all the numbers that actually matter,” writes Katie Brown with the industry-backed organization Energy In Depth. The Obama administration has not yet been able to link groundwater contamination to fracking, but you can be sure they will continue to try. The Environmental Protection Agency has also (for now) failed to link fracking to groundwater contamination in three separate studies it conducted, nevertheless, it is actively pursuing civil and criminal fracking-related liability on other grounds. 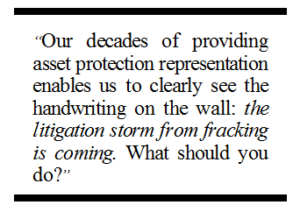 Earlier last year, the Energy Department found that fracking is safe if done properly – something over which the landowner/lessor has no control. This is a VERY BIG “if”. Nevertheless, because the effects of hydraulic fracturing have never been fully studied, many fear irreparable damage to human health and the environment. Among the concerns are contamination of drinking water aquifers; harmful discharges into rivers, streams, and publicly-owned treatment works; and increased emissions of toxic air pollutants. LIKELY SOURCES OF LIABILITY. The most likely sources of liability from fracking are: violations of the Clean Water Act, public nuisance claims arising from seismic activity caused by fracturing, wrongful death claims arising from gas accumulation explosions in residences and businesses, strict liability, negligence and recklessness claims arising from medical conditions caused by fracking chemical runoff and natural gas leaks, sub-surface trespass claims, landowner-lessors’ liability for damage caused to neighboring properties and residents. CONCLUSION. A lot of people are becoming wealthy as a result of the current boom in energy development. It is a fact that in our society such persons become litigation targets. We strongly recommend using experienced, qualified legal counsel to be certain that your asset protection structure is properly implemented. Remember: all attorneys are not alike, and neither are all asset protection plans. Base your decision on the experience and qualifications of the attorney you are considering.